One of the triumvirate of Frost programmes that dominated ITV weekends in the late 1960s and early ‘70s, Frost on Sunday concerned itself with the lighter end of the entertainment spectrum. Made at a time when David Frost was hosting a chat show in the US and then jetting back to the UK to do three shows over the weekend, Frost on Sunday concentrates this energy into fifty minutes worth of light entertainment featuring numerous sketches from Ronnie Corbett, Ronnie Barker – who won a BAFTA for best Light Entertainment Performance – and Josephine Tewson (the latter two fresh from their stint on Hark at Barker). Amongst the shows many guests are Rolf Harris, Matt Monro, Michael Bentine, Des O’Connor, Ted Ray, Kenneth Williams, Vincent Price and Michael Palin as Julie Andrews (aka L. F. Dibley). 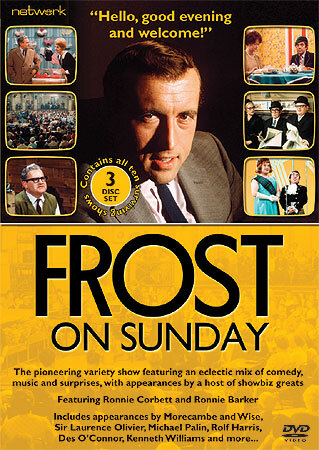 A number of editions of Frost on Sunday no longer exist – this set includes the first show from 1968, which was the subect of a technical strike and so has no on-screen credits. The rest of the shows come from the second series in 1970, including the edition on 8th March 1970 where the team decamped from their Wembley studios to the London Palladium to present that year’s British Film and Television Awards. Though this episode only exists in a slightly edited format, the special show features Laurence Olivier, Morecambe and Wise, Marty Feldman and John Alderton with the Fenn Street Gang (in character!). Buy it direct from Network DVD, priced £24.46, here.